The commanding stage presence and familiar feel of a full-size kick drum is something all drummers can identify with. And now you can incorporate the presence and performance of an acoustic kick drum into any V-Drums kit with the KD-180. 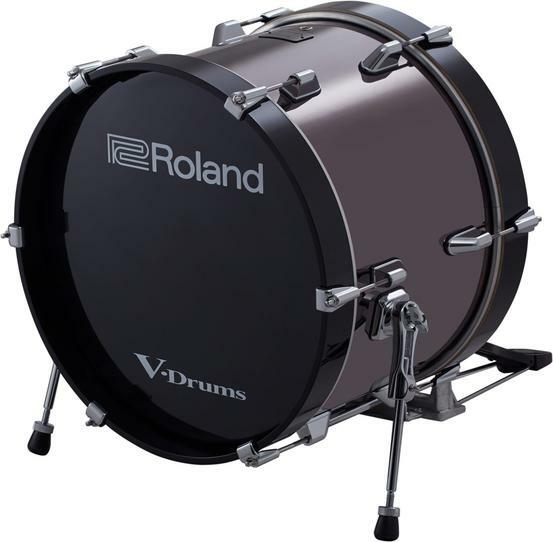 This ready-to-play solution features a standard 18-inch, high-quality, all-birch acoustic bass drum shell with Roland’s advanced kick trigger electronics preinstalled. Roland’s innovative air-damper mechanics work alongside the 18-inch acoustic shell to ‘move air’ and provide resistance as the beater hits the head, providing stable and accurate triggering with authentic acoustic feel. The KD-180 works with double kick pedals, and is compatible with most V-Drums sound modules. The KD-180 is also a great fit for hybrid acoustic-electronic setups, blending the appearance of an acoustic kick with the convenience of triggering any drum sound you desire.